In many marketing departments there are folders with photos, press releases and miscellanous documents. This kind of state makes it difficult to search in a structured and efficient data base. Furthermore this state excludes a fast editing and exchange of the files between the involved persons. The meebox has a central storage and concept of roles and rights. Thus you get order and structure in your file management and your processes. Moreover the meebox enables tagging of photos and documents. Meta data of photos will be automatically collected at the upload of the files. Hence photos, press releases and miscellanous documents can be easy edited, exchanged and found by the search function. Furthermore the logging function of the meebox sends a notification to all involved persons via e-Mail. Consequently the collaboration between all involved persons will be increased which leads to lesser time of editing and costs. The fast and intuitive usage in addition to less monthly costs lead to a fast usage of the meebox and a fast return on investment. There is often missing a central storage for files in many companies and projects. 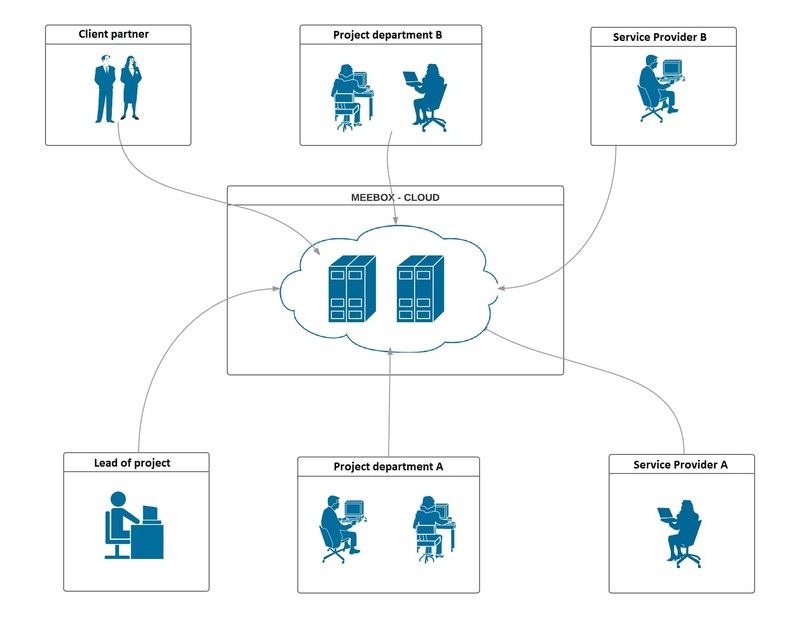 This central storage is applied to connect external departments, teams and further service provider. The meebox builds up a structured data base and orders the processes. Therefore you can utilize the concept of roles and rights making available the necessary files for involved persons. Thus, it is possible to edit in a structured manner on drawings, designs, plans, and so on. Moreover the meebox enables you tagging photos and documents. The meta data of project files (e.g. in pdf-files) will be automatically collected at the upload of the files. You get the information from the dedicated info fields in the meebox mask. The described functionality of the meebox engages a fast and efficient search of files. Furthermore the logging function of the meebox sends a notification to all involved persons via e-Mail. Consequently the collaboration between all involved persons will be increased which leads to lesser time of editing and costs. The fast and intuitive usage in addition to less monthly costs lead to a fast usage of the meebox. Hereby there will be a fast return on investment for the company and all involved business partners. 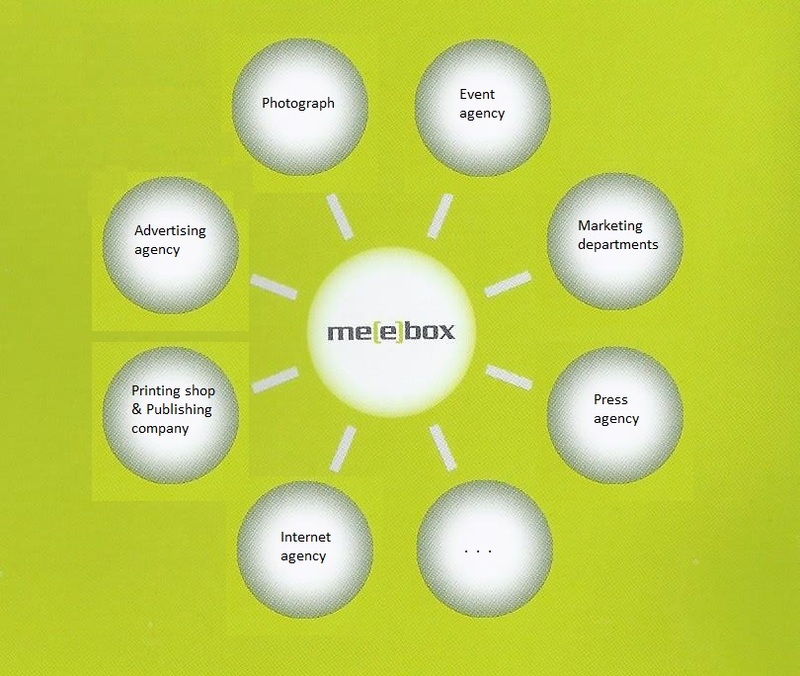 Another scope of application of the meebox is the usage in agencies, publishing companies and printing shops. Hereby it is also possible to connect partners, for example if you want to exchange files with a printing shop. One use case could be the printing of magazines in publishing companies. In general it is also possible to connect the subscribers to the meebox if you want to distribute the magazines digital online. At agencies it is possible to connect further service providers as well as customers. Generally the meebox builds up a structured data base and orders the processes. Therefore you can utilize the concept of roles and rights making available the necessary files for involved persons. Moreover the meebox enables tagging of photos and documents. Meta data of photos will be automatically collected at the upload of the files. The described functionality of the meebox engages a fast and efficient search and exchange of files. Furthermore the logging function of the meebox sends a notification to all involved persons via e-Mail. Consequently the collaboration between all involved persons will be increased which leads to lesser time of editing and costs. It is also possible to use the meebox in photo studios. Hereby the meebox is engaged as a platform for the exchange of the pictures between the photo studios and the customers. First the photos will be uploaded in the meebox cloud after the photo shooting. In the second step the customers get a generated link which makes it possible for the customers to download the pictures as zip-archive or individually. 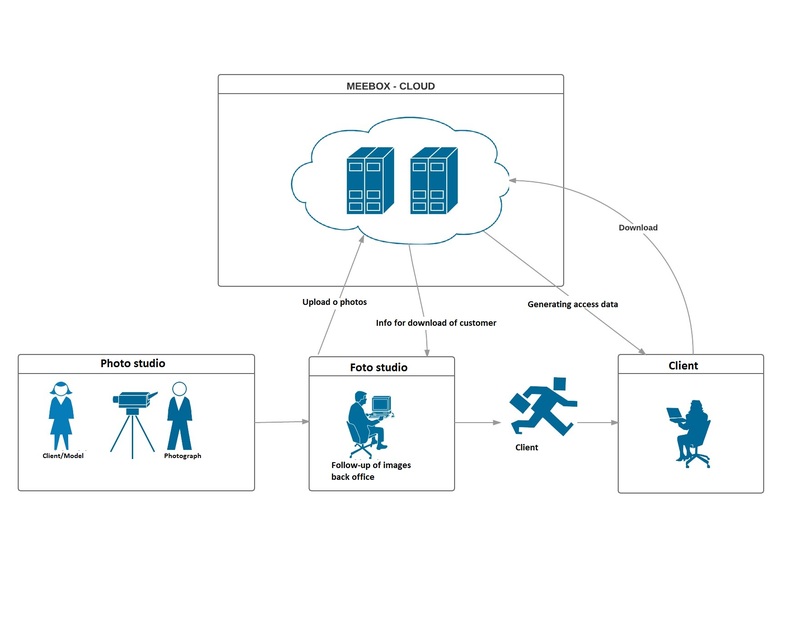 The exchange between the meebox cloud and the parties is generally proceeded over an encrypted connection. Finally the photo studios get a notification after the customers have downloaded the pictures. This is also visible in the tracking history of the meebox.